Photograph by Renate Ponsold. 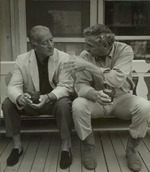 Photograph includes: Adolph Gottlieb, Syd Solomon. B/W; aprox. 20x23.